Every year the Insurance Information Institute (I.I.I.) and State Farm recognize Lightning Safety Awareness Week (June 18-24) by estimating the toll of lightning claims in the United States, writes the I.I.I. research team. Last year insurers paid out nearly $862 million in lighting claims to more than 100,000 policyholders, a 4.5% increase from 2015. Damage caused by lightning, such as a fire, is covered by most homeowners insurance policies. Florida—the state with the most thunderstorms—remained the top state for lighting claims in 2016, with 10,385, followed by Texas (9,098), Georgia (8,037) and Louisiana (5,956). To learn more about an LPI-certified lighting protection system, click here or visit lightning.org/find-an-installer. Next time you’re home when a heavy thunderstorm rolls in, take a moment to think about how damaging lightning losses can be and how insurance helps. In fact, insurers paid out $790 million in lightning claims last year to nearly 100,000 policyholders, according to a new analysis by the Insurance Information Institute (I.I.I.) and State Farm. Damage caused by lightning, such as fire, is covered by standard homeowners policies and some policies provide coverage for power surges that are the direct result of a lightning strike. It’s due partly to the enormous increase in the number and value of consumer electronics that the average cost per claim has continued to rise, Lynch explains. There were 99,423 insurer-paid lightning claims in 2015, down 0.4 percent from 2014, but the average lightning claim paid was 7.4 percent more than a year ago: $7,497 in 2015 vs. $7,400 a year earlier. The average cost per claim rose 64 percent from 2010 to 2015. By comparison, the Consumer Price Index (an inflationary indicator that measures the change in the cost of a fixed basket of products and services, including housing, electricity, food, and transportation) rose by 9 percent in the same period. In recognition of Lightning Safety Awareness Week (June 19-25), the I.I.I. and the Lightning Protection Institute (LPI) encourage homeowners to install a lightning protection system in their homes. These systems are designed to protect the structure of your home and provide a specified path to harness and safely ground the super-charged current of the lightning bolt. The growing market for smart home technology makes installing a lightning protection system even more important, noted the I.I.I. It is also an opportunity for designers, builders and code officials to include lightning protection systems in their plans. The number of lightning deaths in the United States in 2015 continues to rise, the National Weather Service (NWS) has warned. So far this year some 22 lightning fatalities have been recorded, just four shy of the 26 deaths recorded for the whole of 2014. 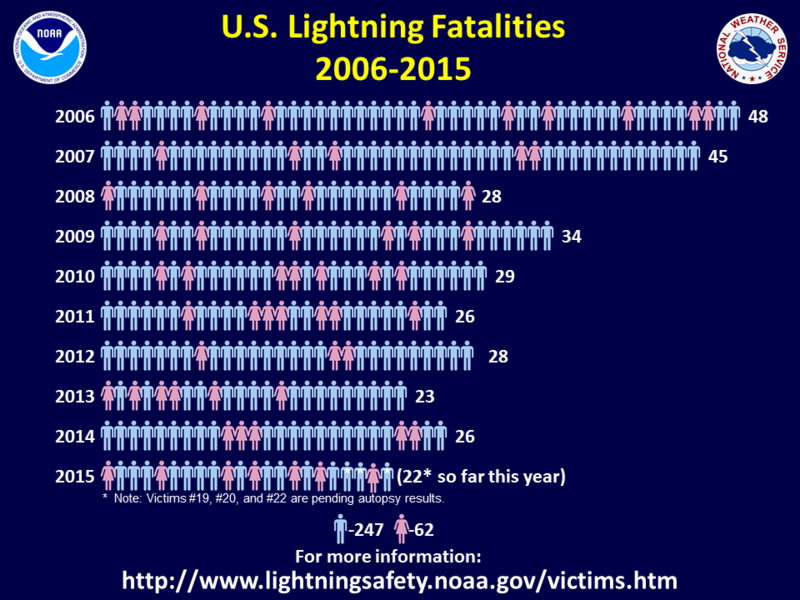 Alabama, Florida and Colorado top the states for lightning deaths in 2015 to-date with three lightning deaths each. Lightning kills an average of 49 people in the U.S. each year, and hundreds more are severely injured, according to the NWS. While storms can be deadly, the number of insurance claims from lighting strikes in the U.S. has been in a period of steady decline, according to the Insurance Information Institute (I.I.I.). Total insured losses from lightning were up 9.7 percent in 2014, though overall incurred losses between 2010 and 2014 are still down 28.5 percent. An analysis of homeowners insurance data by the I.I.I. and State Farm found there were 99,871 insurer-paid lightning claims in 2014, down 13 percent from 2013. Yet the average lightning paid-claim amount was up 26 percent, from $5,869 in 2013 to $7,400 in 2014. Still, lightning remains a very costly weather-related event. Despite fewer storms, insurers still paid $739 million in lightning claims to nearly 100,000 policyholders in 2014, the I.I.I. notes. The Lightning Protection Institute offers some useful lightning safety tips here. Severe thunderstorms again took their toll this weekend as one fan was killed and nine injured as a result of lightning strikes following a NASCAR race at Pocono raceway on Sunday. The Associated Press reports that multiple lightning strikes occurred behind the racetrackÃ¢â‚¬â„¢s grandstands and outside one of the gates as fans were leaving after warnings to take cover from the lightning and rain as the race was postponed. Earlier, on Saturday, an estimated 60,000 fans and 3,000 staff, artists and vendors were evacuated from the annual Lollapalooza music festival in Chicago in 38 minutes, ahead of a severe thunderstorm warning for the area. Over at Wunderblog, Dr. Jeff Masters notes that NOAAÃ¢â‚¬â„¢s Storm Prediction Center (SPC) logged over 150 reports of wind damage from the storm, with five of the thunderstorms containing winds in excess of hurricane force (74 mph). The Chicago Tribune reports that many of the measures leading up to the evacuation had been outlined in a severe weather plan jointly developed by the city and Lollapalooza promoter C3 Presents. The festival resumed three hours later. The Insurance Information Institute (I.I.I. )Ã‚ notesÃ‚ that in 2011 there were 26 lightning fatalities, three fewer than the 2010 total of 29 deaths and 11 fewer than the 10-year average of 37 fatalities, according to data from the National Oceanic and Atmospheric Administration (NOAA). The I.I.I. offers tips and resources on lightning safety here. The newsÃ‚ that 77Ã‚ Air Force ROTCÃ‚ cadets escaped injury after lightning struck a utility pole at their camp in Mississippi earlier this week reminds us not to overlookÃ‚ thisÃ‚ dangerous hazard. While seasonal severe thunderstormsÃ‚ have rightlyÃ‚ put the focus on tornadoes, lightning is an underrated killer and cause of property damage. I.I.I. 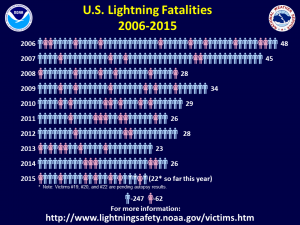 facts + statistics on lightning show that in 2010 there were 29 lightning fatalities, five less than the 2009 total of 34 deaths and ten below the 10-year average of 39 fatalities. Insured lossesÃ‚ from lightning-related claimsÃ‚ totaled just over $1 billion in 2010, up 30 percent from $798 million in 2009, according to the I.I.I.